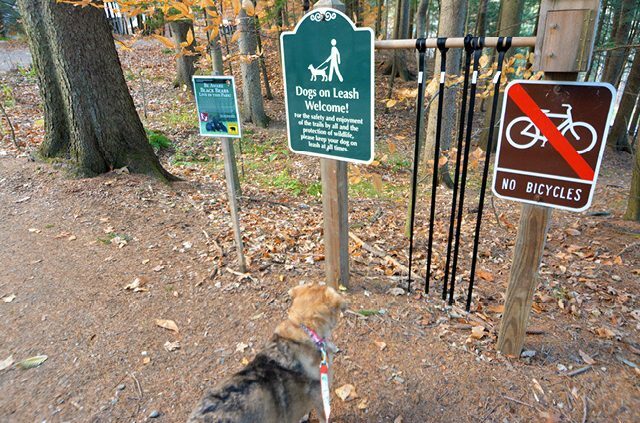 Belle, a beagle mix, looks over the signs at a dog-friendly Vermont park. Belle was sprawled on the bed, pawing through Four Legs & a Tail magazine, after a long day enjoying the pleasures of Vermont’s great outdoors. Her sister, Sadie, was already under the covers, snoring, when there was a knock at the door. Belle and Sadie made it to the door before I could stand up and were ecstatic when it opened up-on two women in hotel uniforms, brandishing covered plates. “Which of you gets the chicken potpie?” asked one server, removing a cover, releasing chicken aromas into the hotel room. “Who gets the steak and vegetables?” asked the other. Belle was getting pushy. Sadie was circling. The servers remained calm, raising their voices over the excitement. “Where should we put these?” the chicken potpie woman asked. “The floor?” I blurted. And there was a just a beat, a split second of OMG in each dog’s eyes as plates were placed before them, and they realized that every morsel was theirs. Room service is just one of the amenities at the AAA Three Diamond Rated Essex Resort and Spa in Essex Junction, Vt., where canines are welcomed with bowls, Frisbees and snacks. And the Essex is just one of many places in Vermont where the welcome mat is rolled out for your dog – or cat. Here, pet-friendliness is not just a buzzword, but a heartfelt part of the hospitality. You’ll find that families with four-footed members are welcome at accommodations, attractions and, of course, in the great outdoors. Stay at the Essex Resort and Spa. Vermont is especially great in fall, when the state’s fall foliage turns it into leaf-peeping mecca. 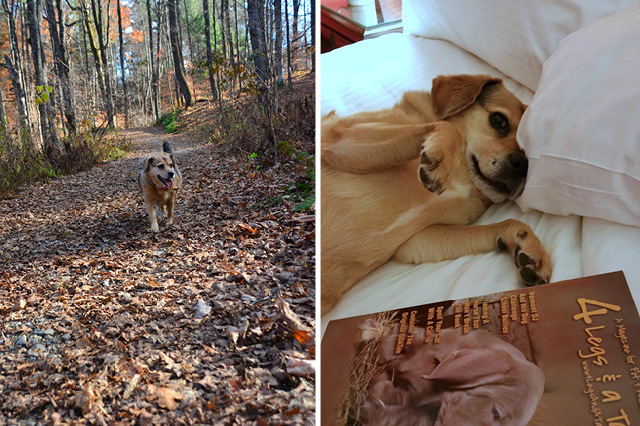 Belle, a beagle mix, explores a wooded area in Vermont and takes a rest on a comfy hotel bed. Belle and I stayed at three different inns over the course of a six-day trip – my husband Paul came up with Sadie, our one-eyed Jack Russell mix, halfway through, meeting us at the Essex. 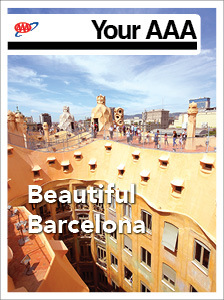 All our accommodations were at well-known, well-heeled places that are prime bases for a fall getaway. Our first stop was the historic Woodstock Inn and Resort, a AAA Four Diamond hotel, in central Vermont. Belle and I hadn’t really been on an adventure in a couple of years – our first was when I transported her some other rescues from West Virginia to a foster home in New Jersey. I wound up falling in love with the beagle-mix passenger with calm brown eyes, and a mouth that occasionally curled up in a smile. I knew she was a good traveler. I also knew she had a bit of separation anxiety. So, I wasn’t entirely blindsided when, during an incredible dinner at the Red Rooster, the Woodstock Inn’s AAA Four Diamond restaurant, the maitre d’ apologized, but suggested that I have des-sert in my room. Another guest had reported that Belle was … well, maybe howling wasn’t the right word, but whining did not convey the decibel level, either. My dessert was delivered and eaten in front of an indignant Belle, who got no rewards for whine-howling. We did spend quality time together late that night in the game room – a cozy retreat with a pool table, around which I imagined several cigar-chomping canines with cues in hand. Belle immediately became fascinated by a small can marked “rubbish.” Eventually, I coaxed her over to the fire, where we took a nap in a miasma of warmth, panting and floating dog fur. 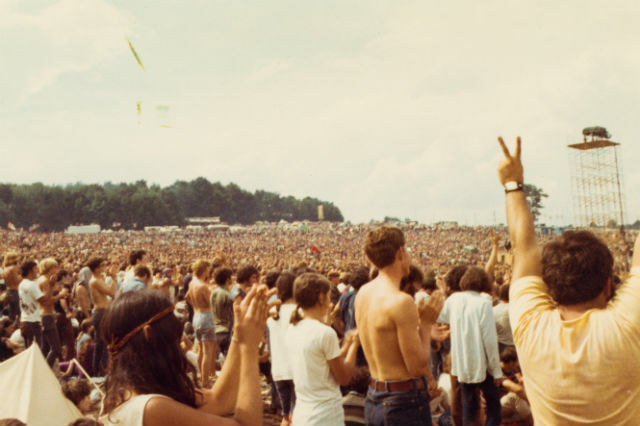 Stay at the Woodstock Inn. The next day we visited Sugarbush Farm, 5 miles from Woodstock down a bumpy gravel road. 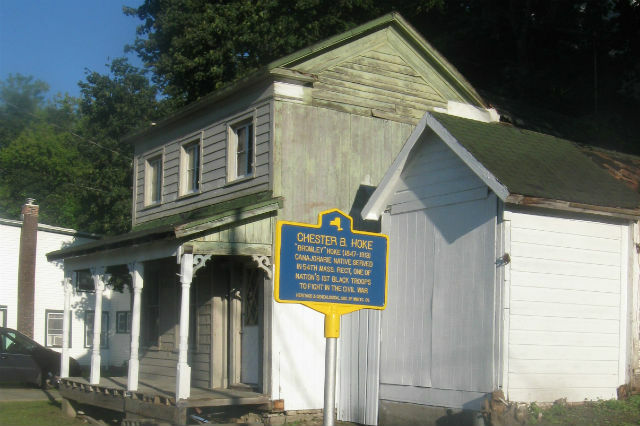 The place is known for its cheeses and maple syrup, and dogs are allowed on the grounds – to visit the animals, walk the maple trail and visit the sugar house. 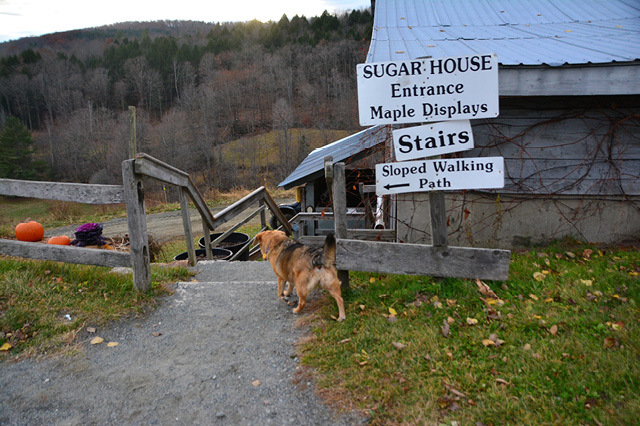 Sugarbush Farm allows dogs to visit the animals, walk the maple trail and visit the sugar house. The tasting room is supposedly off-limits, but the staff, noting Belle’s excitement after gleaning her first whiff of cheese, ushered her in – with me in tow. She continued pulling as I sampled the cheddar cheese cubes near the entrance. Then I noted that the pulling had stopped. I found Belle standing – yes, on her two back legs – with her front paws on a table heaped with crackers, syrups, cheeses and sausages. She stood watching as the samples disappeared into human mouths. I could almost see the “Drop it!” thought-balloon. She gave a longing look toward the venison container as I tugged her away, instead buying two boxes of handmade, bone-shaped dog biscuits with “Vermont” imprinted in them. I promised they would be a great treat when our trip was over. Dogs don’t have a good grasp of time, however. After lunch the next day, we found our room festooned with bits of biscuit box; not a crumb was left. Our second stop was the aforementioned Essex, which bills itself as Vermont’s Culinary Resort and Spa. Waiting in our room was a collapsible bowl and rope throw toy for the dogs, and a plate with three Triscuity looking crackers for me. I was surprised at how tasteless they were, considering the Essex had such a foodie rep. Only at checkout did I learn they were dog treats. 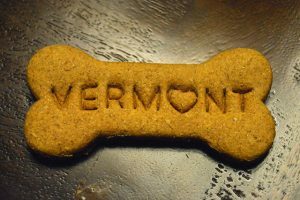 The Essex is 10 minutes from Burlington and the notably pet-friendly Vermont Pub & Brewery. Though we had to sit outside, the server was extra-attentive to Belle and brought her a bowl of water before getting my order. Our final stop was at Topnotch in Stowe, where both Belle and Sadie had in-room massages. The masseuse was patient and gentle, though neither dog seemed to have an out-of-body experience. At least no blood was drawn, always the bottom line on a successful day with dogs. Topnotch is known for its cuisine, its tennis program and its convivial (and pet-welcoming) bar. But best of all for dog families are the canine rooms – suites on the first floor with a fenced-in porch; just open the gate and off you and your dog can go – or, well, she can go. You get indoor plumbing. Stay at the Topnotch Resort and Spa. Speaking of outdoors. Stowe is full of options for dog walks and hikes. We all loved the Stowe Recreation Path, a trail you can pick up right from the village that leads through foliage-fringed meadows, along a creek, even past a classic white-spired church and red barn. We got more Vermont biscuits to take home. And maple syrup. But the best souvenirs were our memories – not just of beautiful Vermont in the fall, but of our pups, having the time of their lives, with us in tow. Where have you gone on vacation with your pets? Tell us in the comments section below and enter the AAA Pet Travel Photo Contest. Read more about pets and pet adventures. Pets and Vacation Planning: Should They Stay or Should They Go? What Does It Mean To Be Financially Literate? AAA Opens Branches in Farmingdale and Yonkers, N.Y.